LOYOLA Meralco reminded everyone on Saturday night that Ceres-La Salle and Global FC are not the only teams contending for the crown in the Philippine Football Federation-Smart Club Championship. The Sparks frustrated two-time defending champion Ceres, 1-0, at the Rizal Memorial Stadium to move a step closer to clinching a spot in the semifinals. 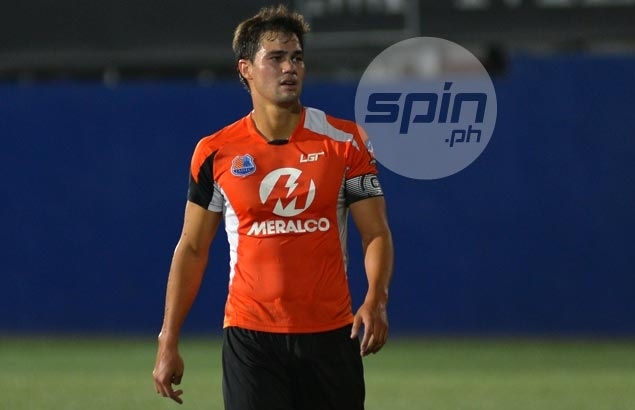 Phil Younghusband struck as usual for the Sparks, who banked on an early cushion that they preserved after Ceres went a man down in the middle of the first half following an ejection to midfielder Arnie Pasinabo. The victory enabled the Sparks, who dispatched Laos FC, 4-0 in their first game, to supplant their victims at the top of Group A with six points. It was a rare loss in the national club tournament for Ceres, which had almost gone unbeaten in their last two title runs. Now the Bacolod powerhouse is in danger of missing the knockout phase after slipping to third spot in the four-team group behind Kaya FC, which also has three points but is ahead on goal difference. Kaya, which lost to Ceres, 3-2, on Friday, registered in the win column with a 6-0 shutout of Laos earlier in the day. Younghusband, who fired a brace against Laos, converted the all-important goal just 15 minutes into the marquee matchup, when the Azkals strike star caught a feed from Matt Hartmann before beating Ceres goalkeeper Michael Casas. Things turned bad to worse for Ceres after Pasinabo was sent off following a scuffle with Kaya defender Eddie Mallari in the 32nd minute. Joven Bedic scored for the second straight match, while Joshua Beloya, OJ Porteria, Chris Greatwich, Louis Clark, and Alfred Osei were also on target for Kaya in its rout of Laos.